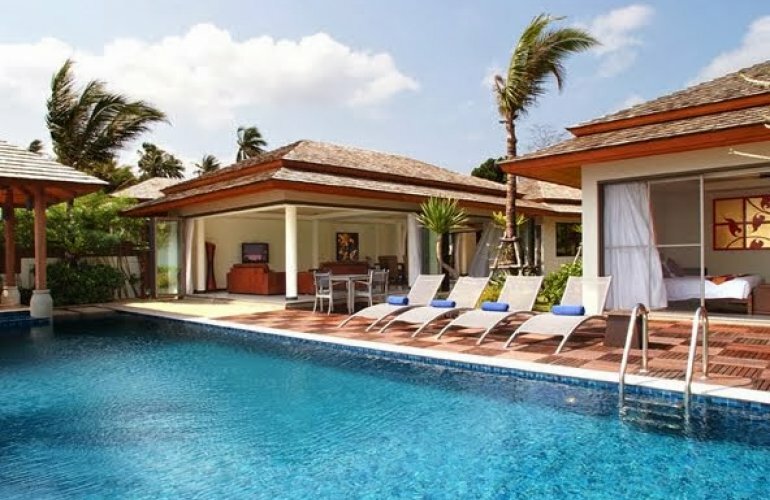 A luxurious four bedroom beachfront villa located in an exclusive residential community next to the sandy beach at Bo Phut on Koh Samui's northeast coast. This stylish beach front haven is just a ten minute drive from the airport, and only 15 minutes from the lively tourist centre of Chaweng. Designed to take full advantage of the Samui climate, the villa highlights the Thai concept of merging indoor and outdoor living. Its large open terraces and garden areas, and the folding glass doors to the main living rooms create wall-less spaces for maximum socialising in this idyllic tropical setting. The sala at one end of the pool, furnished for comfortable relaxing, a large terrace complete with sun loungers, and an al fresco dining area, are yet more outdoor features of this stylish property inducing a feeling of freedom. The beach and ocean views from the villa and poolside are stunning. The accommodation is very private and flexible and is spread over several pavilions housing the main living areas and the bedroom suites, all fully air conditioned. There is complimentary Wi-Fi broadband Internet access provided for guests' use, and each of the bedroom suites has a personal safe. Throughout the villa the decor is modern and bright and the colour tones of the accessories contrast with the cool white walls and floors. High use is made of natural materials such as wood and stone, and two-tiered wood-shingle roofs offer authenticity in this delightful area. From the moment the intricately carved wooden entrance doors are thrown back you enter a beachfront haven where you will not fail to be captivated. A winding stepping-stone pathway weaves its way from the entrance towards the pavilions, coming initially to one on the right where there are two bedrooms. The first is a twin-bedded suite with lemon accessories. There is a flat screen TV, a dressing area, and the en suite shower room has lilac mosaic tiles. Sliding glass doors lead from the bedroom into the garden. The second bedroom has a double bed with plum and orange accessories, a flat screen TV, dressing area and a blue en suite shower room. The sliding glass doors to this bedroom look across the garden and the pool towards the sea. The master bedroom suite is in a pavilion on the other side of the stone path, and occupies the whole building. This room has a feature four-poster bed with white drapes, tropical water hyacinth furniture, orange accessories, and contemporary wall art. The sliding glass doors to the front lead to the sun terrace, lawn, pool and the beach. A recessed dressing table is behind the bed, as is the large dressing area, and sliding wooden doors which lead into the fabulous en-suite. Here there are twin hand basins and a walk-in shower area with attractive brown mosaic tiling and a tropical inner garden. But dominating the bathroom is the large raised bathtub that sits directly opposite the doors and from where you can soak and relax whilst looking through the bedroom to the ocean. The wall behind the bath is textured sandstone and above is a covered skylight letting in the natural lighting. The last bedroom is at the end of the path facing the pool and the sea. This double room has turquoise cushions and accessories, a flat screen TV, a dressing area and an en-suite shower room with blue mosaic tiles. The main living pavilion is opposite the first two bedrooms. Here, plush tan-coloured leather sofas offer comfort and quality, and the solid teak and coconut inlaid coffee table is a feature in itself. On the only wall are mounted the large flat screen for the satellite TV/DVD and a beautiful black and gold piece of artwork. Beyond the sitting area is the open-plan dining room with an impressive dining table and high-back water hyacinth chairs. Glass doors completely fold away on three sides of the building. At the rear of the room is a pond feature with sunken stepping-stones leading over to the kitchen, which also has folding doors so the whole of this building appears open to nature and free of traditional barriers. The kitchen is well fitted with wooden units, black high-gloss surfaces, superior chrome appliances and a central island feature incorporating a breakfast bar. There's a guest bathroom, and a door to a Thai-style kitchen. Sunken stepping-stones provide the way to the sala at the right hand end of the pool. Here, comfortable all-weather furniture provides a welcoming place to sit, relax and enjoy the views, and beyond the sala is an outdoor dining area overlooking the beach. An outdoor shower is close to the steps that lead to the private beach access.